A California high school teacher was released from jail Friday two days after video surfaced showing her forcibly cutting off a student's hair while singing the national anthem. 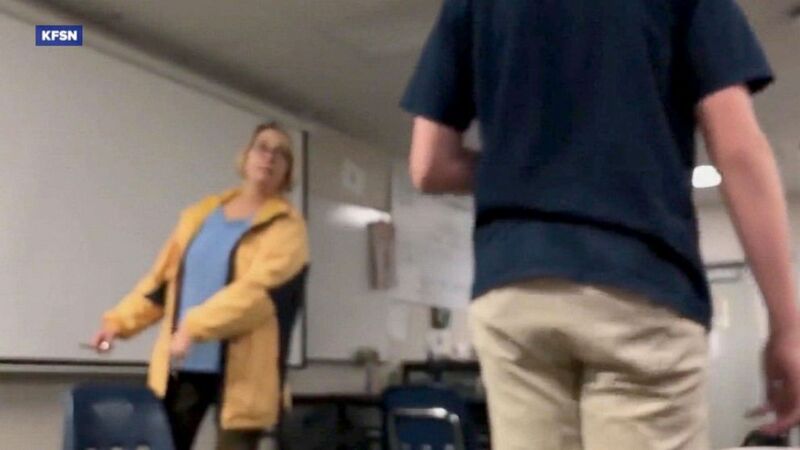 A video obtained by ABC television station KFSN shows Margaret Gieszinger, a teacher at University Preparatory High School on the campus of College of the Sequoias Community College in Visalia, holding a pair of scissors in one hand as she points to a chair at the front of her classroom and urges a male student to sit down. The footage shows Gieszinger grab a hold of the the boy's short hair as he reluctantly takes a seat and his classmates watch in disbelief. She then shears off a chunk of his hair and tosses it over her shoulder, all while belting out "The Star-Spangled Banner." Margaret Gieszinger was arrested for forcibly cutting off a students hair. The video continues to show Gieszinger walk to the back of the classroom, where she grabs a hold of a girl's long tresses while raising the scissors in the air and snipping the blades. The student manages to escape unscathed as the rest of the class runs out of the room in horror. Students told KFSN that Gieszinger entered the classroom that morning with the scissors in her hand and declared that it was "haircut day." One student, who spoke on condition of anonymity, told KFSN that after the incident he ran to the school's main office for help. "We think she's going to try to be funny and be like, 'Oh, did you really think I was going to cut his hair?' But she did cut a hair off, and she started singing the 'Star Spangled Banner' and she was singing it really loudly as she ceremoniously tossed a chunk of hair behind her," the student said. "I hope I never have to see her at the school again because I know for a fact I can never see her as a respectable authority figure in my life." Students told KFSN they don't know what caused Gieszinger to behave in such a way, noting that she had experienced another breakdown earlier in the week. The College of the Sequoias District Police Department arrested Gieszinger, 52, on suspicion of felony child endangerment. She was held at Tulare County's pre-trial facility on $100,000 bail, according to inmate records. It was not immediately known if she has obtained an attorney. On Friday, Gieszinger was charged with one count of false imprisonment, two counts of cruelty to a child, two counts of battery and one count of assault. The six misdemeanor counts could add up to three years and six months in jail if she's found guilty. She was released from jail Friday night on her own recognizance and will next appear in court on Dec. 17. She covered her face and did not take questions from reporters while leaving jail with her husband. Gieszinger's husband told KFSN he's shocked and confused by what happened. "Trying to figure it out myself, so I don't know what happened," he said. "It's not her. It's not who she is. So I don't know what was going on with her. I don't have any clue as to why she did that." 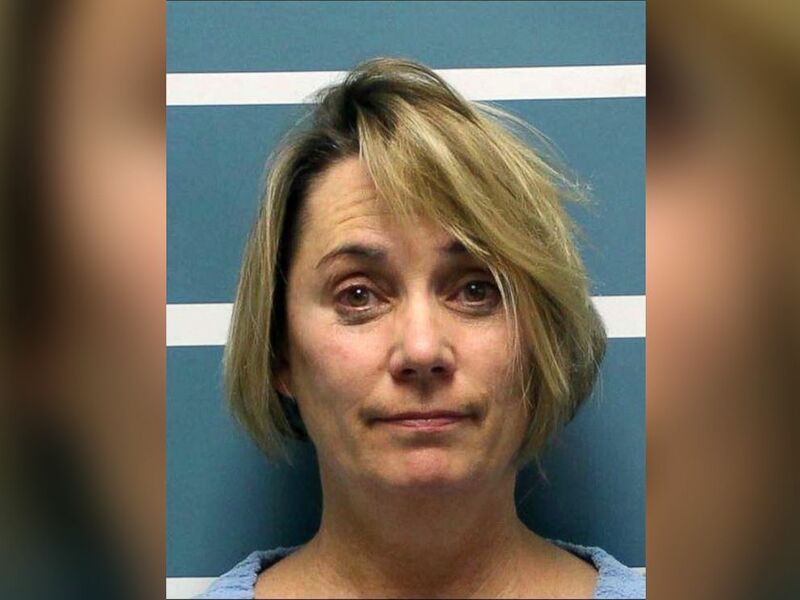 Margaret Gieszinger, a high school teacher in central California who was arrested on suspicion of felony child endangerment, after forcibly cutting the hair of one of her students while singing the National Anthem, authorities said. Tulare County Superintendent of Schools Jim Vidak, whose office oversees the high school, said Gieszinger was "promptly removed" from her classroom after the "disturbing" incident and will not be returning. "The staff at University Preparatory High School and the administration at the Tulare County Office of Education are deeply concerned for the students who were subjected to the disturbing behavior in Margaret Gieszinger’s class yesterday morning," Vidak said in a statement Thursday. "We are reviewing all available information and will take the most severe employment action appropriate." A "highly qualified" substitute teacher will take over Gieszinger’s class for the rest of the semester as the school looks for a permanent replacement, according to Vidak. "To support all students on the UPHS campus today, we have sent top counselors from our mental health services program," the superintendent said. "They will continue to be available to the students as long as necessary."